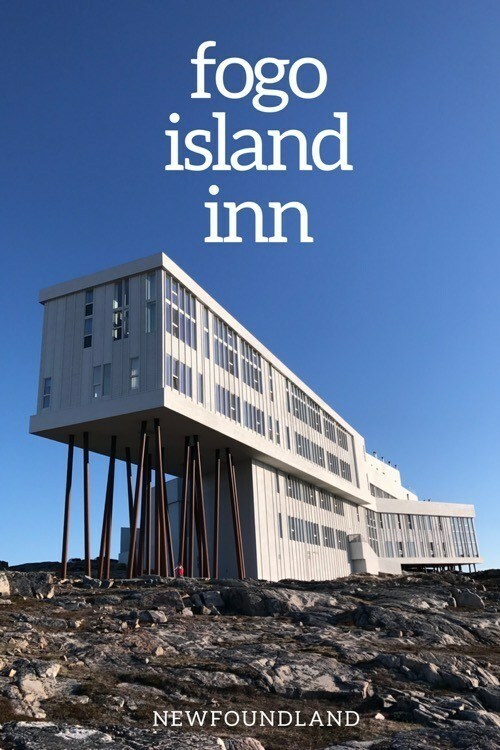 I am pretty sure that I first stumbled across the Fogo Island Inn in Architectural Digest some time around its opening in 2013. 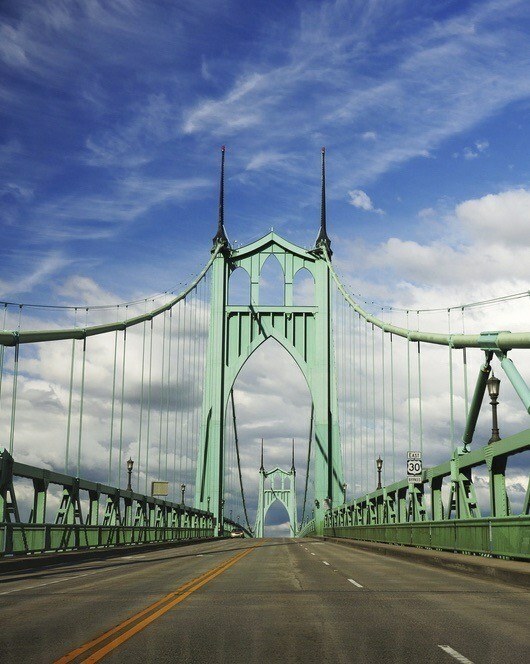 I will admit to a swell of pride when I realized that this magnificent project, built at what seemed like the end of the earth, had been an all-Canadian endeavor. 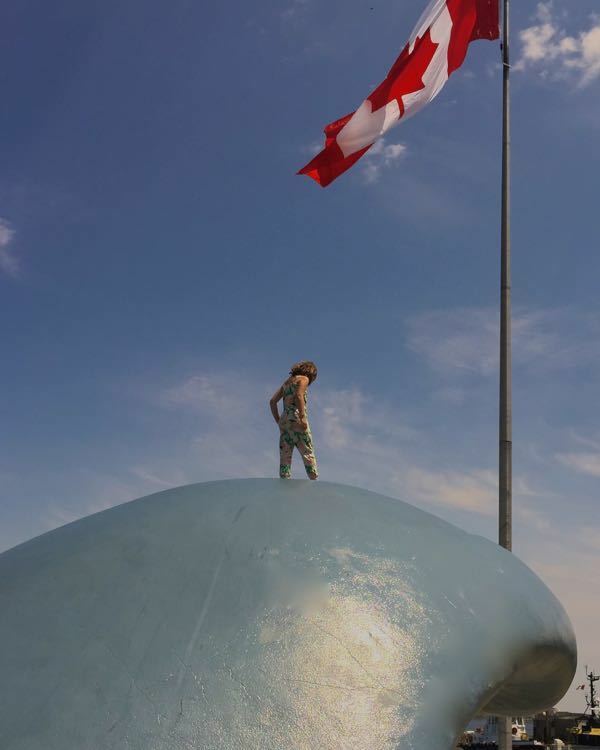 As it turned out, Fogo Island was not quite at the end of the earth, (although it comes very close to North America’s most easterly point of Cape Spear, Newfoundland), and I became determined to make my way there one day. As the years passed, I would find myself checking the Fogo Island Inn website periodically, trying to justify a visit. I was waiting for a sign of some kind that would make it a no-brainer such as a lotto win, a bank error in my favour, or perhaps a modest inheritance from a distant relative. Sadly, the years went by without one of these events coming to pass. My tipping point came in the spring of 2017 when I happened across an article declaring that it would be an epic season for iceberg spotting off the coast of Newfoundland. (In spring and early summer, large chunks of ice break off the Arctic shelf, passing by the coast of Newfoundland and along its famed Iceberg Alley.) I made the call to pull the kids from school for a week (under the guise of a trip promoting science and Canadiana) to enjoy a short visit to Fogo Island as part of a larger Newfoundland road trip. 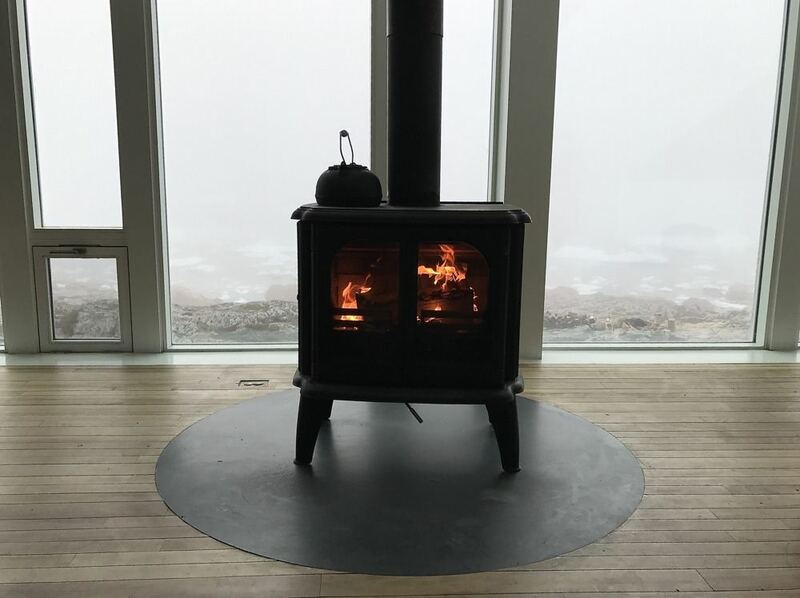 I’m dying to tell you all about it, but first, as a primer, here is a short Fogo Island Inn video. 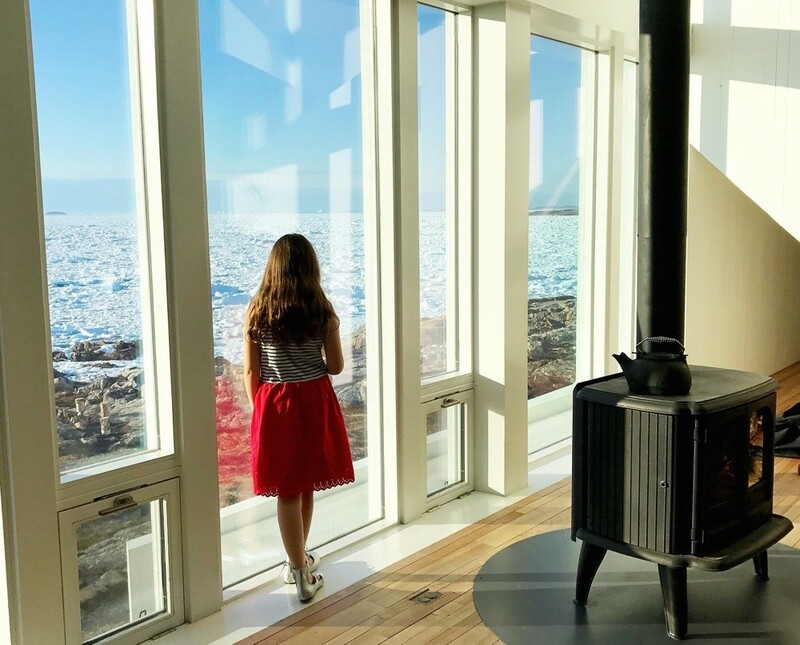 Prior to visiting the Fogo Island Inn, I didn’t know the complete story of how this incredible Newfoundland luxury hotel came to be. I was, however, aware of the plight of the cod fisherman in eastern Canada. In the early 1990’s, the east coast cod industry collapsed, largely as a result of new industrialized fishing methods that were unsustainable. For the decades that followed, fishing communities such as those on Fogo Island would see young people leaving in droves to seek their financial futures elsewhere. 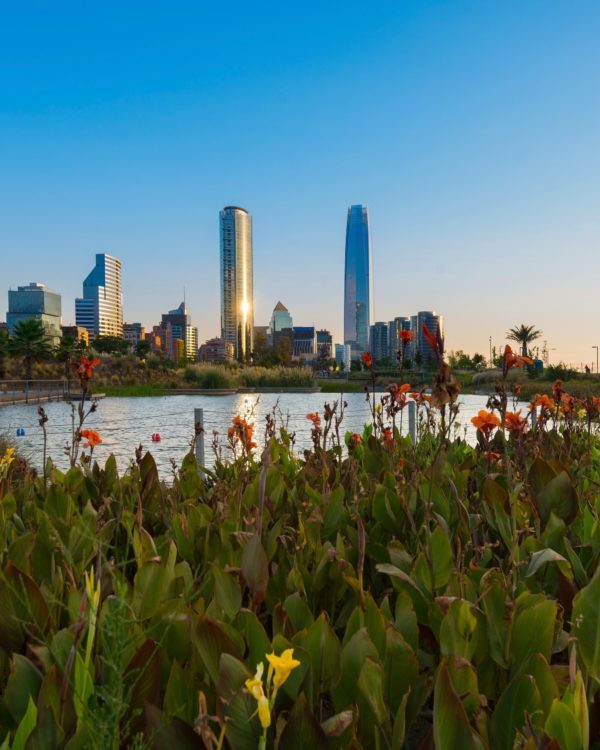 Enter resident Zita Cobb, who grew up on the island, but had left to pursue a career in high tech — subsequently becoming a multi-millionaire when she cashed out of JDS Uniphase in 1999. 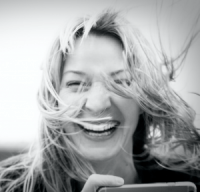 In 2004 Zita, who had since returned to the island, donated 10 million dollars of her own capital to found the Shorefast Foundation along with two of her brothers. With further funding from numerous agencies, she set into action a plan to secure the economic future of Fogo Island, while at the same time preserving its culture. 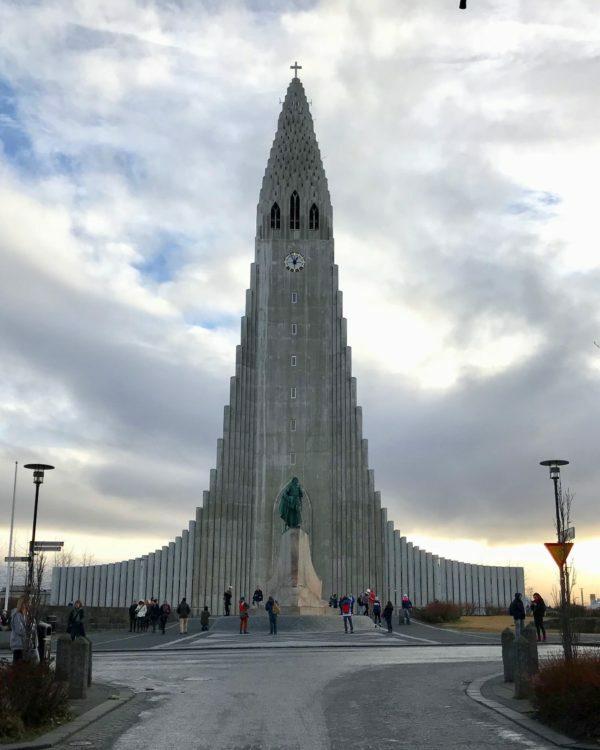 As the story goes, she apparently met with very little resistance when pitching the project to Newfoundland-born architect Todd Saunders, who by then had set up shop in Norway. So…with that said, let me tell you about our experience. Typically I wouldn’t start a post with a getting to section, but it was such an exciting part of our adventure ! Although the truly well-heeled can fly into Fogo Island via helicopter from Gander International Airport, most of the guests we spoke to at the Inn had, like us, taken the ferry over from a place called Farewell. The Fogo Island ferry handles both cars and walk-on passengers, making it convenient for guests who are making Fogo Island part of a larger Newfoundland road trip adventure. 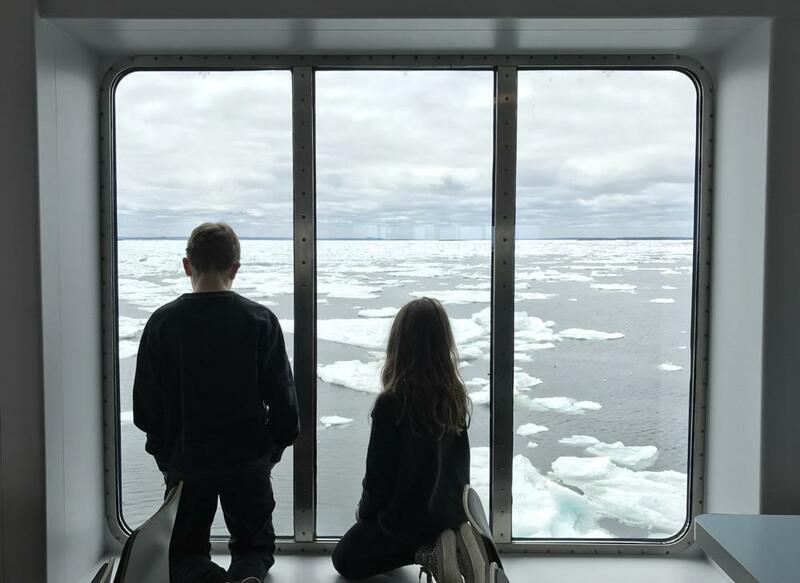 As we visited in the beginning of June, during what was an unusually cold year for Newfoundland, the ferry crossing was an event in itself. It felt more like we were on an icebreaker actually, as the ship shuttered and bashed its way through a minefield of ice. As we had arrived on the island a little early for check-in, we took some time to explore. We could not resist a stop at the Tower Studio — one of four Todd Sauders designed artist residences on the island. 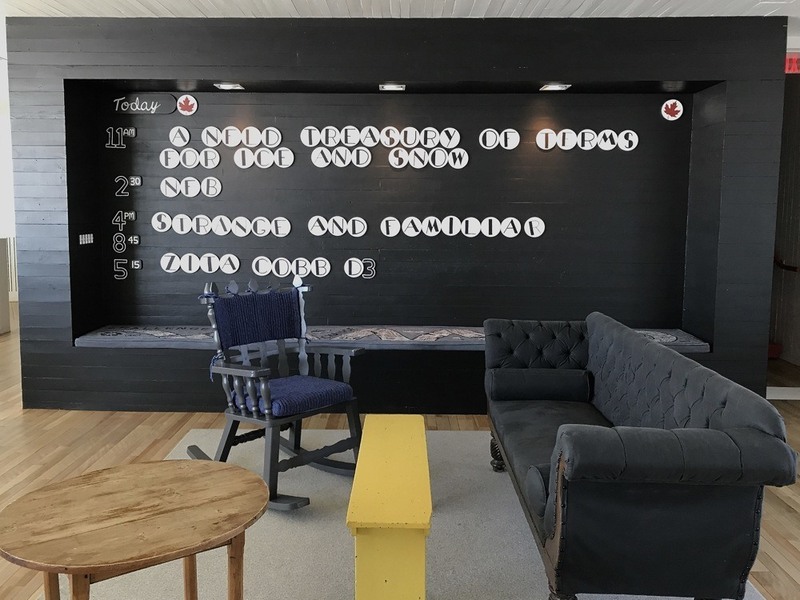 Learn more about Fogo Island residencies for artists at Fogo Island Arts. We were welcomed to our Fogo Island accommodations by island local, Corey*. As beautiful as I had hoped our room would be, it far exceeded my expectations. 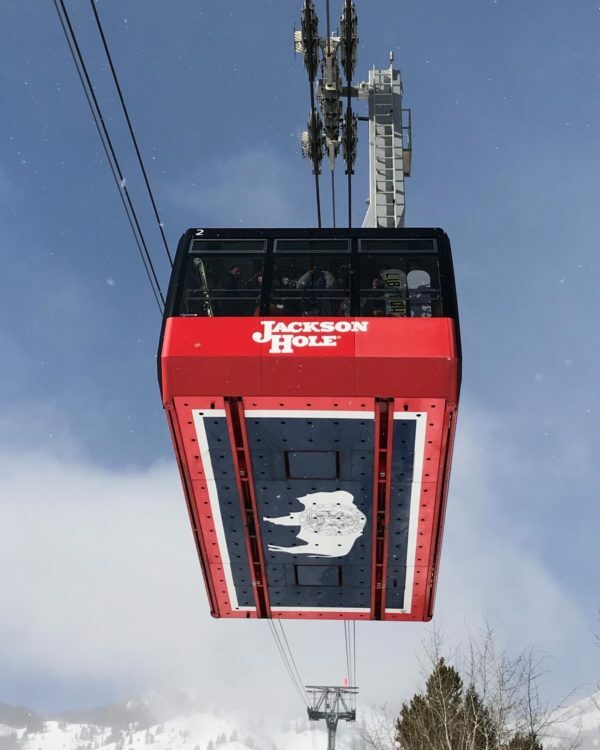 Traveling with children, we had chosen one of the larger suites (27) with floor to ceiling windows, a loft bedroom, a separate main floor nook containing two single beds, a full living room with wood burning fireplace, and a gigantic bathroom with soaker tub. I imagine that the view is spectacular all of the time, but what was especially mesmerizing to me was the ever-changing ice covered seascape, that would change dramatically depending on the wind and tide. 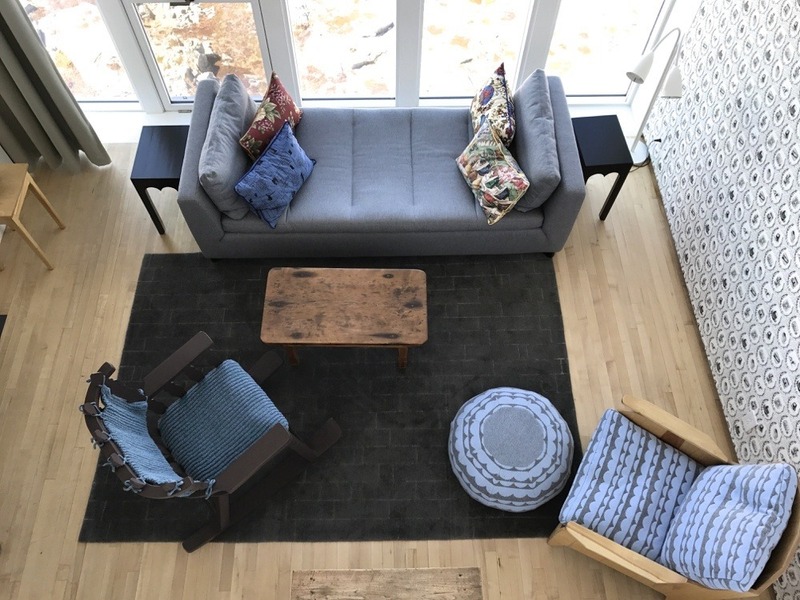 The beauty of this contemporary take on traditional Fogo Island arts and crafts could be found throughout the room in details such as the felt covered hangers, the hand knit rugs, the cheery patchwork quilts, the custom wall paper print (each room has a unique design) and in every piece of locally crafted furniture. Honestly, the room was so beautiful, and the welcome tray full of baked goodies so enjoyable, that I had a hard time prying myself away, despite the fact that my kids were dying to explore the hotel further. 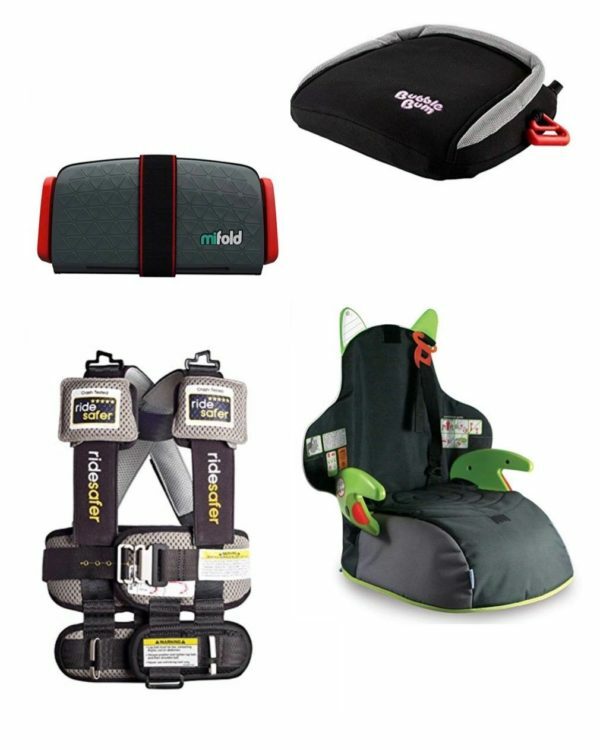 *Funny story: I still can’t help but giggle out of embarrassment when I think about Corey asking me if I had “….seen one of these before?”. “Is it for a back massage?”, I asked, looking down at the controller. No, it was not. That controller, with all those buttons and icons showing a person in compromising positions, was the controller for the automatic, high tech, toilet. I appreciated the fact that Corey did not so much as show a hint of a smile, although I hope he had a good laugh about it with friends later. At the urging of my children (because I would have just as happily spent 2 days in our gorgeous room), we set out to explore the hotel. 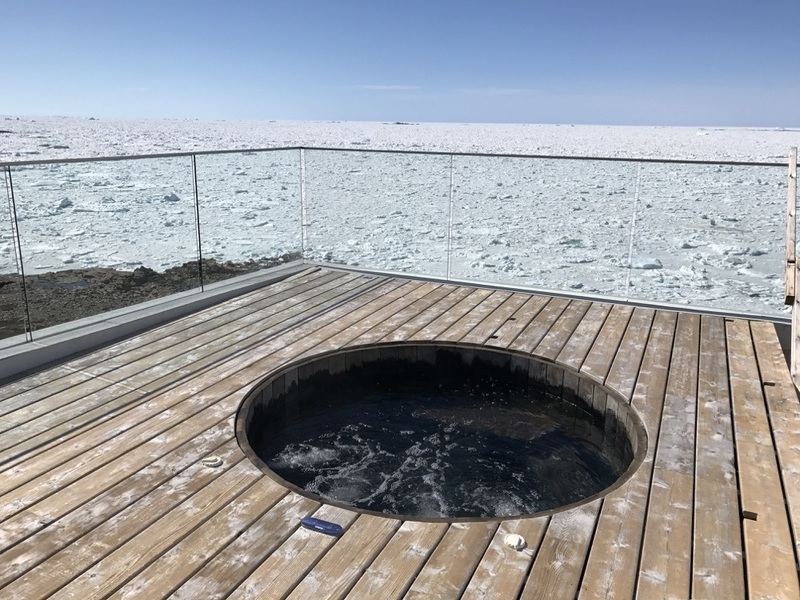 We went straight to the top to see the incredible rooftop spa, where two outdoor hot tubs and two saunas awaited us — the former taking advantage of a spectacular view. Working our way down a floor, we came across the 37-seat movie theatre. 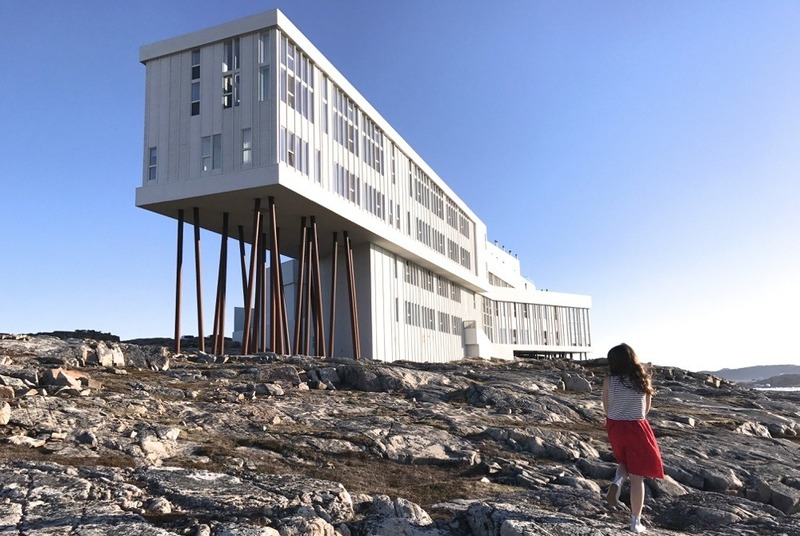 A collaboration with the National Film Board of Canada, the theatre shows many NFB documentaries, films about Fogo Island and the Inn, as well as some contemporary films. 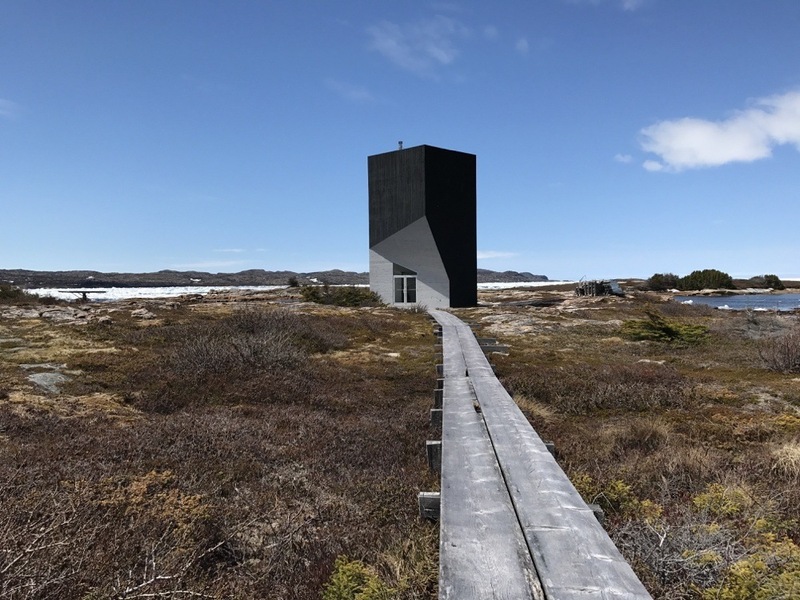 While we were there, we took in the award winning movie Strange and Familiar: Architecture on Fogo Island. While I very much enjoyed watching this film at the Inn, I wish I had watched it before our visit. It truly helps you understand why this project, on this particular island, is so important. Take a peek at the trailer here. Returning to the main floor and the hub of all the activity, we took a stroll through the art gallery and marveled at the library (with the most exceptional collection of Canadian literature). Of all the gathering areas in the hotel, perhaps the most spectacular is the restaurant. Floor to ceiling windows offer the most incredible Atlantic sea views, providing almost too much of a distraction from the delicious locally sourced fare (partridge berries, fiddleheads, Atlantic cod and so much more). As an example, one morning at breakfast, all of the guests left their tables to watch a fox working her way back to her den. Top Service: I have to share this story as a testament to the great service at the Inn. At our first breakfast, my daughter asked for orange juice, but our server explained that they only had juices made from local berries. The following day, low and behold, orange juice had magically appeared on the menu just for her (although of course by now, she had become a big fan of the berry juice). 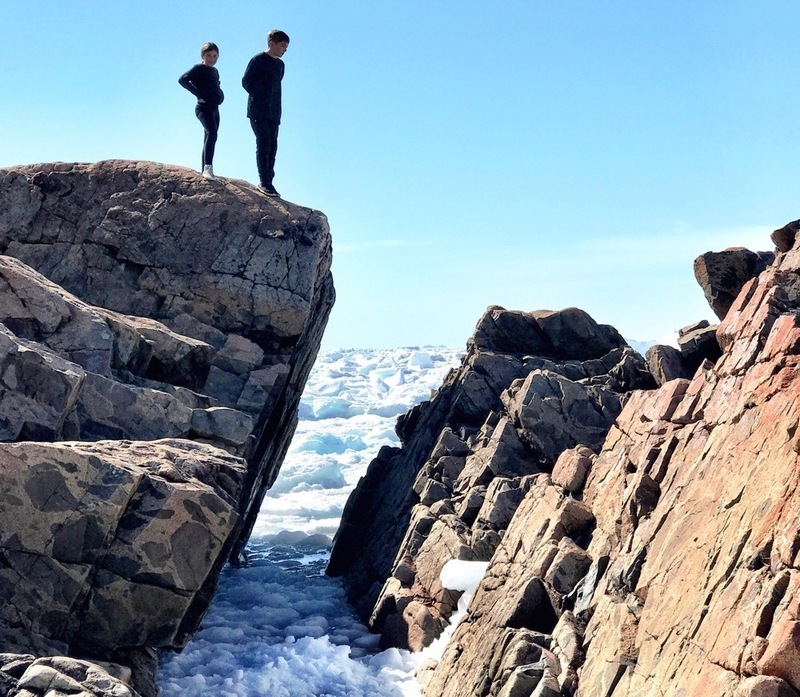 Outside of all the other wonderful activities at the Fogo Island Inn, the highlight for my kids was to spend hours parkouring on the giant boulders outside. My husband and daughter have a travel tradition that apparently has been shared by other past guests of the Inn — the polar bear swim. Finding a calm bay just down from the hotel, these two took their icy plunge and followed it up by a well deserved warm-up in the rooftop hot tubs. 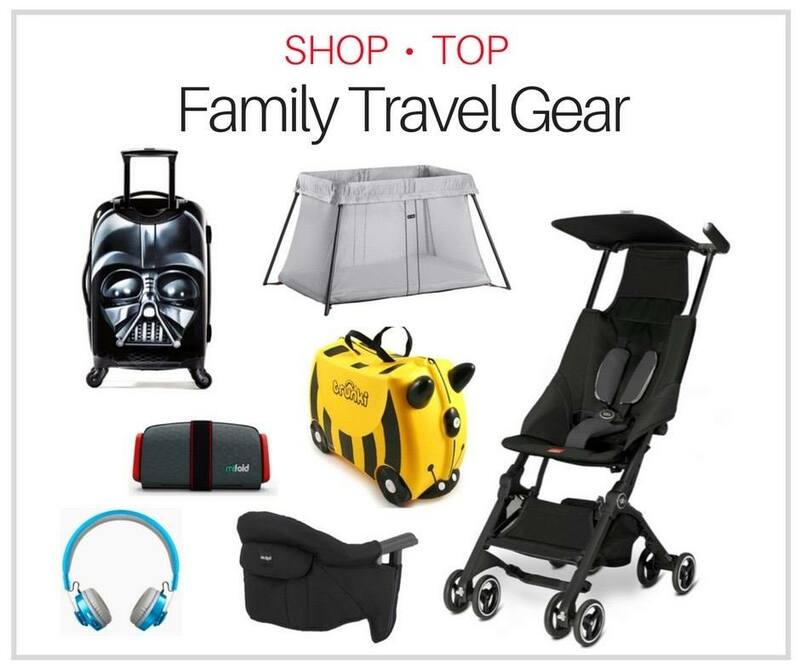 Clearly, it’s not for everyone — certainly not for me, but they wouldn’t miss it. 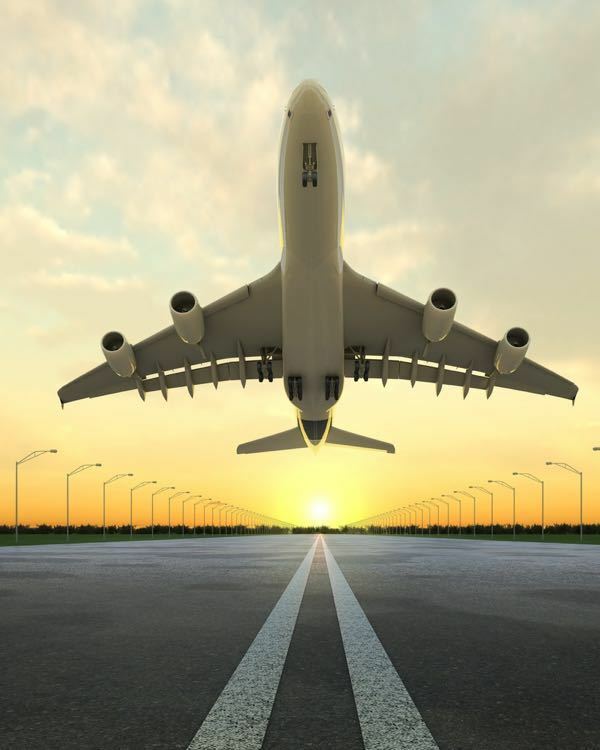 The service is really unique at the Inn and helps to contribute to an immersive and enriching travel experience. As an example, Sylvia from the restaurant took the time to explain to me the difference between a Newfoundland Kitchen Party and a Shed Party. Incidentally, at the time of our visit, the Inn was building their own contemporary version of a shed in order to offer future guests the experience of a traditional Lobster Boil. We also learned a bunch from island resident Colleen, who kindly drove us to the ferry on our way off the island. She shared with us how Zita Cobb had taught her that she shouldn’t be ashamed of her accent or where she came from — that her heritage was something to be proud of, preserved and treasured. 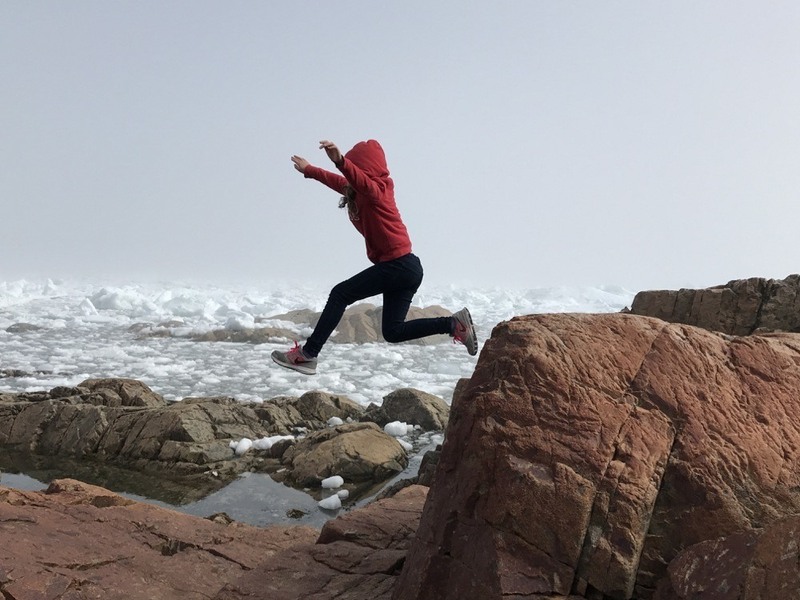 After years of the young people leaving the island, Colleen’s daughter and family were in the process of moving back to Fogo Island. Is Zita’s project working? Time will tell….but apparently the census numbers are promising. 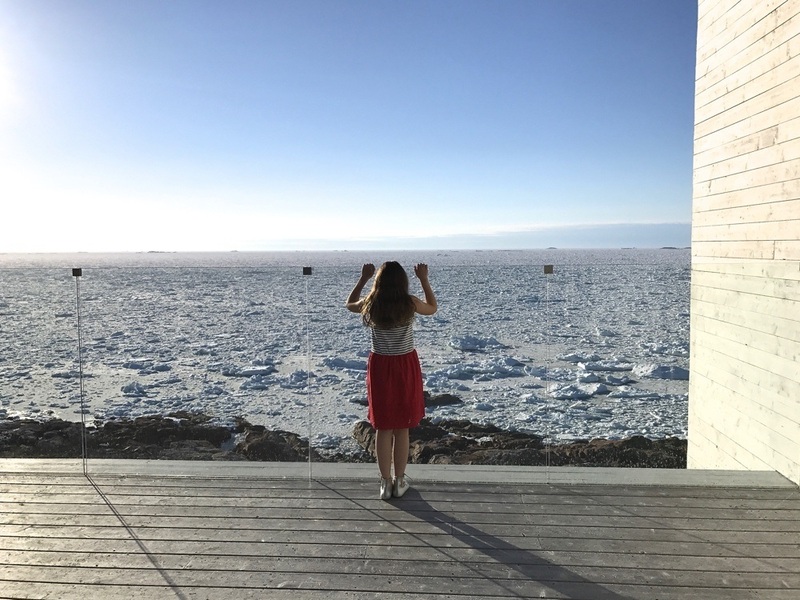 I would return to the Fogo Island Inn in a heartbeat, but I’d also like to return to Fogo Island even if I couldn’t stay at the Inn. I would love to have a longer visit in the peak of summer during cod fishing season and for The Great Punt Race — a community event involving traditional Fogo Island boats. A stay at the Inn includes three meals a day and a day break basket delivered to your doorstep. 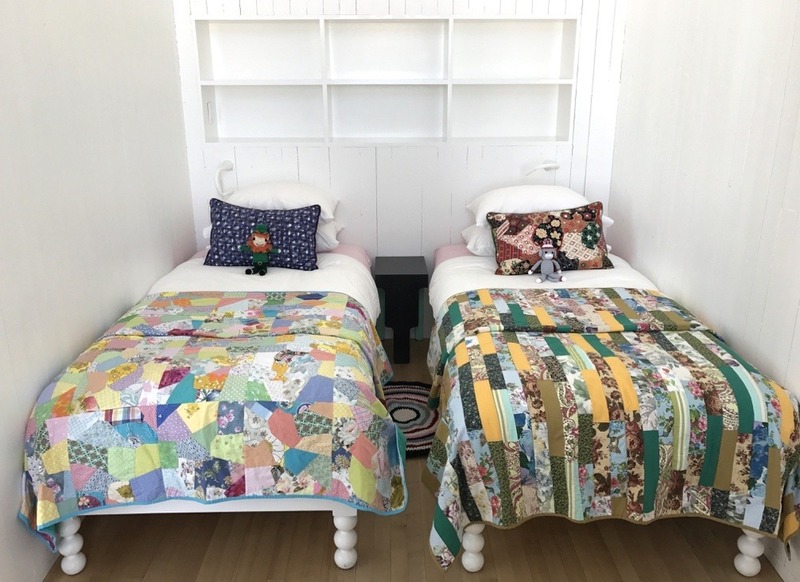 Children under 12 are free when staying in the same room as 2 adults (hence my rush to get to Fogo Island Inn in this particular year). 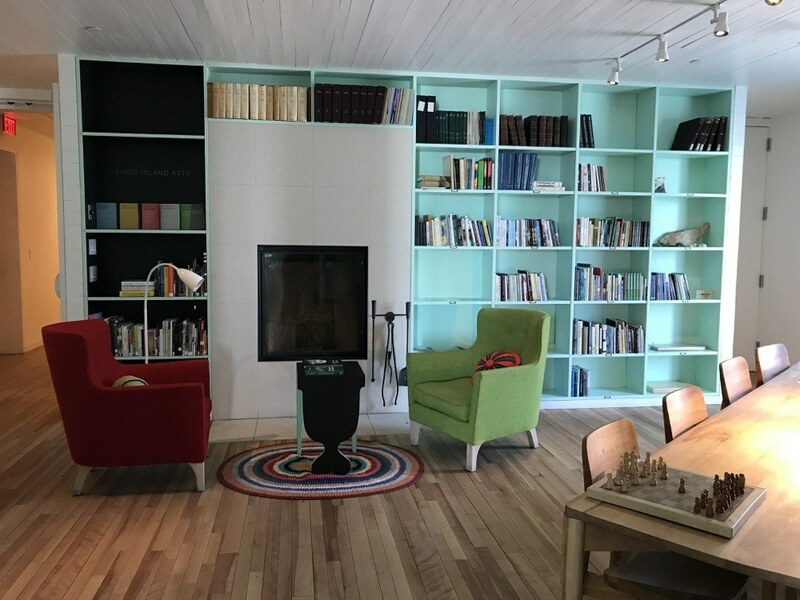 For current rates and availability, please see www.fogoislandinn.ca. 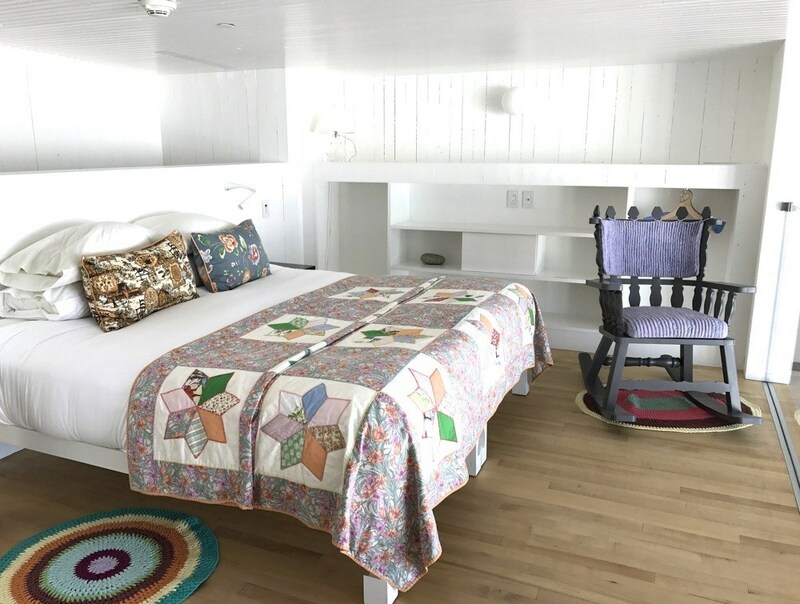 Please also see TripAdvisor Fogo Island Inn reviews here. *If you are not able to stay at the Inn, you may be able to visit for lunch or dinner (subject to availability). 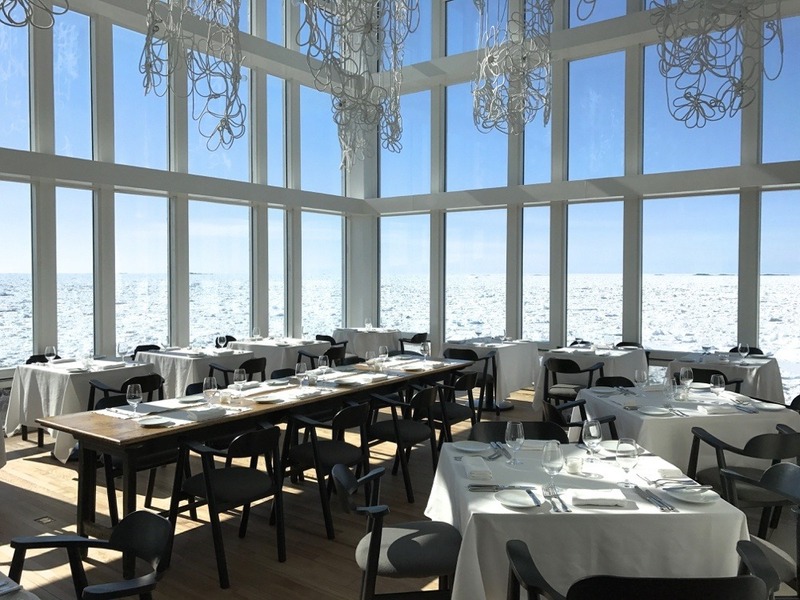 Already have a confirmed reservation at the Fogo Island Inn? Contact me at tara@pintsizepilot.com and I might have a little something special for you. 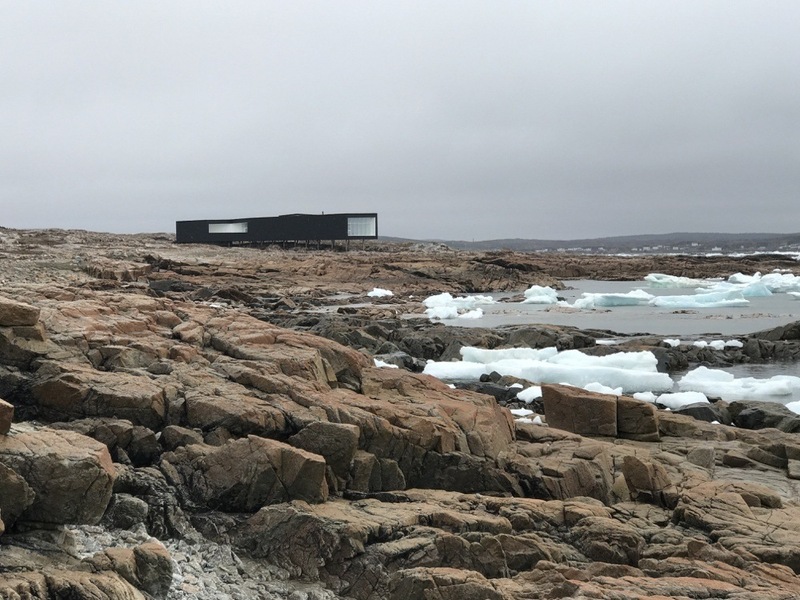 Want to See a Little More of Fogo Island? Fogo Island is such a special place that I created one more little YouTube video. You can see it here. Disclosure: We were welcomed with a discounted media rate stay at the Fogo Island Inn. All opinions are entirely my own. 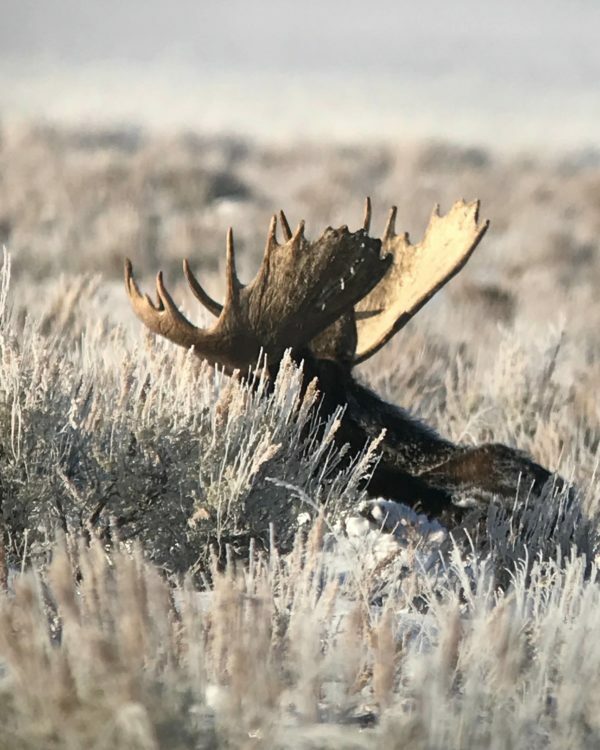 In addition to reading this post, as always on this site, I encourage you to also read current reviews for this property on Tripadvisor. Which month of year did you stay at the Inn? Hi Mandy. We visited the first weekend in June (in an unusually cold year). Tranquil and beautiful! #1 on my bucket list. It is exactly that Cathy !